This past year I’ve really gotten in touch with my musical side. I’ve been learning the piano feverishly, trying to rise up and meet my own challenge. While music and personal finance may seem world apart I’ve come to see many correlations between the two. In music, there are many different ways to learn an instrument. One of those that always amazes me though is learning to play by ear. This method is exactly what it sounds like, you listen to the music and try to replicate it on the piano or whatever instrument you choose. If you’re good at it, you can replicate a song – or rather, replicate the sound of a song without too much experimentation at the keys. Learning to play by ear can take some time. Some people are gifted and can hear a song once and replicate it with a high level of accuracy right away but most people that play by ear have to practice at it. Most of all, those people have to know their instrument. They have to know exactly which key will make what sound and know where all those keys are on the piano. That way when they hear a song they can recognize the notes and replicate them with ease on their own instrument. In personal finance, your balance sheet, your budget and your bank accounts are your instruments. No matter what tune you hear out there in the world there is no way you can replicate that and create the finances that you want without knowing your instruments. On the other side of the coin, if you do know your budget and your balances like the back of your hand, you will be able to accurately play those instruments with ease day in and day out. Your life really is your main instrument though. You go out every day and navigate the world. You typically spend money on things every day be it bills, gas or essentials you and your family need to live. While out there, if you are in tune to your budget and your bank account, you will know exactly what is in there every day. You know where you are in your monthly or even weekly budget. You know what you have allocated to spend where and how much of that you have left. Because you know all that, you know exactly what keys to hit and when – what amounts you should be spending and where. You can play your daily financial life like a harp. If you aren’t in tune to your finances, or they are not in tune in general, meaning not only do you not know where you are your budget and what your balances are but if your finances are in disarray that’s like playing an instrument that needs a tune. 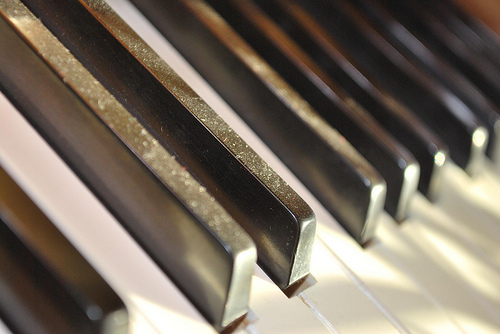 You may be trying to do things right and aiming for the right keys, but when you hit them, the sound still comes out wrong. You need to get your financial instrument in shape before you learn to play it. And never forget that learning to play any instrument takes time and patience. Over time you will know exactly where the right keys are and you will be an expert at playing your finances by ear but until then and even afterward into the future you need to continue to practice. You have to stay familiar with your money and your spending habits. You have to adjust them as your family grows and situation changes. Very true! My money habits changed from when I was single to when I got married and with a kid, more tweaks! Each and every day right? 🙂 Everything has to grow as you do, or they will die off. Small changes (tweaks) really does work. Professional athletes, Olympians and successful people understand this very well. Small changes are probably the most important thing because they are sustainable. Making drastic changes are easier to slip away from once the excitement is gone. Small things can be maintained forever. This is an AWESOME post. And I think it sums up my outlook perfectly – I’m more laissez faire than most PFers and I don’t have ninja spreadsheets, etc, but that doesn’t mean I’m not in control of my money. Thanks ee. I think one thing that sometimes gets lost in personal finance is that it’s personal; you don’t have to budget the same way other people do as long as you know your stuff and are on top of your own books. If you’re satisfied with your money, that’s all that matters!